At the trade deadline last year, the Arizona Coyotes dealt defenseman Keith Yandle to the New York Rangers in a high-profile deal. By receiving Anthony Duclair in return, the Coyotes said, at the time, that was a first step in a significant rebuilding program. 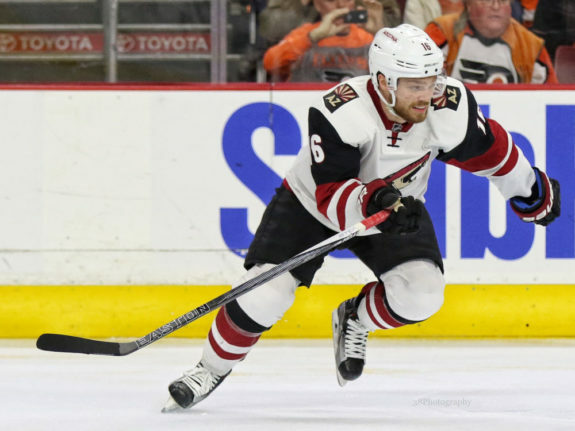 Now at the 2016 trading deadline, Arizona dealt veteran winger Mikkel Boedker to the Avs and again, general manager Don Maloney indicated the deal signified a step to the future. While the Coyotes received veteran leadership in Alex Tanguay as part of the deal, Maloney, more importantly, acquired Kyle Wood, a 6-5, right-handed shot defenseman, who was on the Coyotes’ radar screen for some time. In a flurry of other moves, the Coyotes picked up Matia Marcantuoni, Connor Bleackley, Sergi Plotnikov and Jiri Sekac. All of which will be worthy of a depth chart, but little to stop the immediate bleeding. Whether these deals yield dividends in the future is uncertain, the Coyotes’ season, for now, has grounded to a halt. That may, or may not, portend well for the future, but in the immediate distance, a season which spiraled out of control over the few weeks continues to drift aimlessly. Coming into Thursday’s home game with Anaheim, the Coyotes limped into Gila River Arena with a 6-game losing streak. Winless since Feb. 18 may be one issue, but Arizona faced the hottest team in the NHL. With their 5-1 victory over the Coyotes Thursday night before 11,999 in the desert, the Ducks tied a franchise record with their 10th straight victory. That was established between Dec. 6-28, 2013. To exacerbate an already trying situation, Arizona coach Dave Tippett was forced to rest goalie Louis Domingue, who stared the previous 11 straight games. Noting that “Louie showed fatigue in practice (Wednesday),” Tippet started rookie Niklas Treutle, who made his first NHL start. The results were not unexpected. The Ducks scored on their first two shots of the game, and cruised to their 17th win in their last 19 games. The end for the Coyotes started early. When Treutle failed to handle the puck to the side of his net, Jamie McGinn slid the disc behind the goalie only 4:52 into the contest. Just 46 seconds later, Rickard Rakell converted a perfect pass from Corey Perry into his 17th goal of the season on the power play, and the Ducks had a 2-0 lead less than 6-minutes into the game. The loss extended the Coyotes’ losing streak to seven, and the team has three wins in their last 13 games. From engaging in a Stanley Cup playoff conversation in mid-February, to, as Tippett now says “chasing the game,” the Coyotes have fallen quickly from grace. One of the biggest factors against the Coyotes this season has been their lack of discipline in killing off penalties. That happened again, and this time, the Ducks made the Coyotes pay. Coming into Thursday’s game, Anaheim was third in the league on the power play, and converted 3-of-7 chances with the man advantage as a catalyst for the win. At the same time, the Coyotes were 25th in the league, and 29th at home, in killing penalties. After giving Domingue almost the night off Thursday, Tippett said the rookie net minder will be back between the pipes Saturday at home against the Florida Panthers. Almost, because Tippett pulled Treutle after the second period, and Domingue played the final period. With 18 games remaining, and a possible return of Mike Smith still unknown, the Coyotes will ride out the season on Domingue’s coattails.